I understand the Black & White photo from 1973 used in the previous post caused quite a stooshie in certain circles. Suffice to say only one of the pictured persons is still rallying actively while one other is deeply involved in the sport, but not as a competitor. So how many can you name? Ken Wood, Dom Buckley, Roger Turnbull, Jonathan Osborne, Ian Muir, Rob Baillie, Willie Crawford and Jon Baillie. 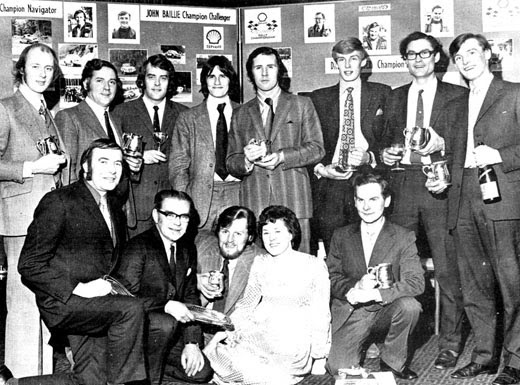 Bill Taylor, Ian McIvor, Drew Gallacher, Wendy Jones (from 'The Scotsman' newspaper) and Ian Wilson.